Bright Lights, My City: Vote, NYC! Did you visit the polls yet today? Go vote this morning en route to the office when you're already out grabbing a latte or make a pitstop after work to make your voice heard! Because of the hardships caused by Hurricane Sandy last week, remember that some New York City poll sites have changed. Please visit the Board of Elections for more info. 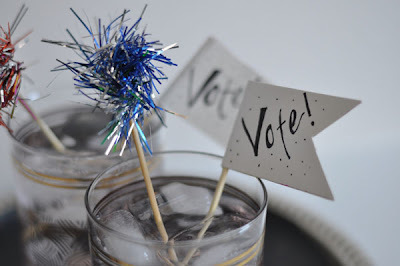 And for a fun Election Day inspired cocktail to cheers with your friends when the winners are announced, check out Style Within Reach for Caitlin's Cranberry Cream Cooler recipe.